Related: Tongva Cultural Workshops --MORE INFO. Related: Mask-Making Workshops -- MORE INFO. "In every culture that exists in the world, people acknowledge and memorialize their dead. While some cultures are very private and don’t even speak the deceased’s name ever again, in the Indigenous culture of Mesoamerica it was and is observed in a manner that celebrates life. "For the second year now Farmlab will honor the ancestors by transforming the Under Spring area into a celebration of life, with hundreds of marigolds, candles, music, art, the beauty reflected in our cultural diversity. We designate this time as the day of La Ofrenda, which translates to The Offering. In collaboration with the, 50/500 Indigenous Elders, the Chinese youth dance ensemble, the Andean song and dance troupe from Bolivia, the Tongva people with their Ancestor Pole ceremony, the Japanese sacred flute music and many other groups from the surrounding, Farmlab invites you to partake of this heartfelt and magical Ofrenda day." :You are welcome to set up your own offering here at UnderSpring. Farmlab will gift you with marigolds, candles and a space for your offering. Please contact us with plenty of lead time. Or, come to the event at sunrise Friday, November 2 to participate with the Tonvga people as they honor with their Ancestoral Pole ceremony at the Yangna village site commonly known as the California State Historic Park. Otherwise join us for a full evening of La Ofrenda, on Saturday, November 3 from 7:30 p.m. to midnight in the Under Spring area." 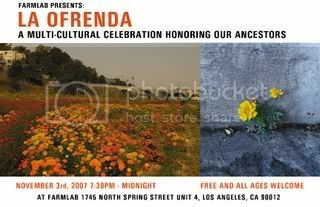 Photos from the 2006 La Ofrenda. Farmlab Photos by Sarah McCabe. and celebrate how they continue to touch our lives.